Major League has no shortage of memorable characters. Stadium announcer Harry Doyle (played by the legendary Bob Uecker) is one of the best. Need proof and affirmation? The Milwaukee Brewers created Harry Doyle talking bobblehead dolls for a stadium giveaway. Unlike most stadium bobblehead promotions, this one wasn't given to everyone in attendance or even the first through the gates. Fans had to buy a special package for "Major League Night" for the July 21, 2015 game in order to get one. The Harry Doyle talking bobblehead is limited to 4,000 pieces. While there are plenty of great quotes and words of wisdom to choose from, there's only so much that can be fit on a sound chip for a bobblehead. But it does have some classics like, "Juuuust a bit outside!" and "This guy threw at his own kid in a father-son game." A tribute to Uecker as much as it is the 1989 comedy that was filmed in Milwaukee, he has been the team's radio announcer since 1971. Appropriately enough, the bobblehead giveaway came on a night when the Brewers were hosting the Cleveland Indians. Milwaukee won 8-1. 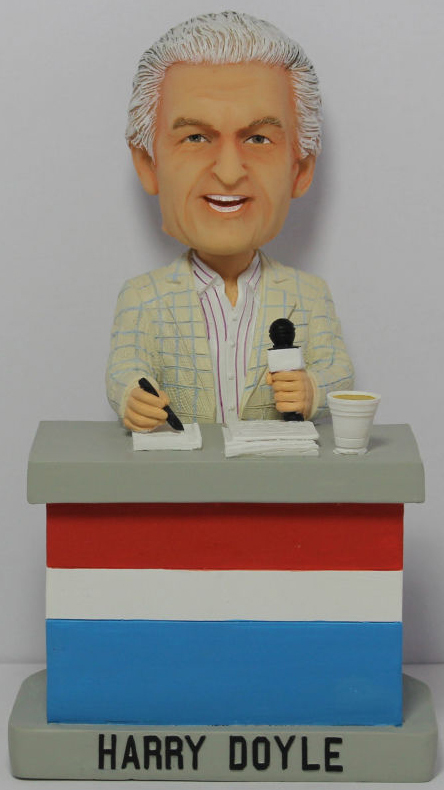 The Harry Doyle talking bobblehead has the announcer sitting at his desk. It comes packaged with the movie's logo in a couple of spots. Most early eBay sales of the figure have been in the $40-50 range.